You are here: Home / WordPress Tutorial For Beginners / How do I make WordPress web pages and blog posts? 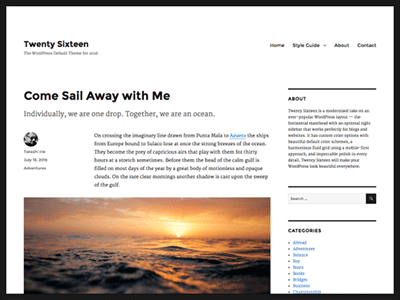 A quick guide to making WordPress web pages and blog posts. Hover over + New in the top bar and choose Post or Page. Use the word processor type screen to type in your content. Use the formatting buttons to add headlines, lists and make text bold etc. Use the Add Media button to add images to your post. In the right hand sidebar choose a Category. Or make a new category. Scroll down the page and enable or disable comments for this particular post or page. Save your post or page. If you made a PAGE, you will have to manually add a link to to a menu so site visitors can click the link and see the page. If you made a post it will be automatically added to your blog listing page. Posts are also automatically added to the category listing for any category that the post is assigned to. You do NOT have to manually add the post to a menu. Post or page: which should you use? Before you make WordPress web pages and blog posts you need to choose between PAGES and POSTS. Use pages for stand alone one off content. Such as your About Us and Contact Us pages. Use posts for everything else. I’ve made another post about organizing your content. You do this by writing posts that are organized into categories and further organized using tags. Adding images to your posts. If you’re brand new to WordPress, this page may be useful. After you log in to WordPress hover your mouse over the +New button in the top bar. You now see the post or page editor. You make a post or page in the same way you would write a word processor document. If you’re new to WordPress I recommend you type your text directly into the post editor screen. It’s just like using a word processor. If you paste text directly from Microsoft Word, the code used to make your new post will include all kinds of extra formatting. You can’t see this extra formatting, but WordPress can. After typing your content into the post editor screen, use the word processor type buttons to add formatting. Use the Add Media button to add images to your post. This is just like using a word processor. BUT! When you click the Publish button, your post or page is not printed on paper, it’s published on the internet inside your WordPress website. If you have used a word processor you will already know what most of the buttons do. But, there are also some buttons that you may not already know about. Add Media: use this button to add images to your page. Add or remove a web link: highlight some text, click the link button and paste the page URL in the box. Insert Read More Tag: regulates how much of the post shows in blog listing pages. Just place your cursor then click the button. I explain about this in another tutorial. Toggle Toolbar: shows or hides the second row of buttons in the editor. 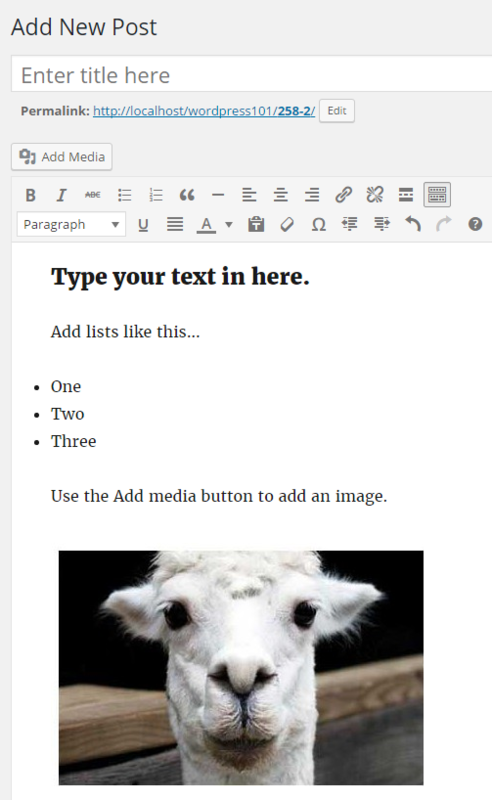 Paste as Text: removes formatting when you copy and paste from a word processor document. Clear Formatting: removes SOME types of formatting form your page. This button removes bold, italic and text color. The Clear Formatting button will NOT change a headline’s size or change lists back into paragraphs. Experiment and see how it works. Just highlight the text then click the button. Special Characters: some characters are considered special in HTML, the language that web pages are made from. These include £½ © ® Experiment with the button to learn more. Choose the most appropriate Category to put your post in. If you’ve already made some categories they will be listed in the category section of the right hand sidebar. If you haven’t made any categories yet, just click the + Add New Category link to make one. Scroll down below the post editor to find the Discussion dialogue box where you can allow comments to be added to this post by it’s readers. Tick the boxes to allow comments and trackbacks. Un-tick the boxes to disallow comments and trackbacks. Previous Post: « How do I write a post without publishing it yet?